Back cover text: These imaginative courses, designed for both individual and classroom use, assume no previous knowledge of the language. The unique combination of practical exercises and step-by-step grammar emphasizes a functional approach to new scripts and their vocabularies. Everyday situations and local customs are explored variously through dialogues, informative texts, and illustrations. 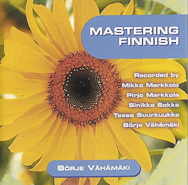 This book is designed to be used with Mastering Finnish CDs or cassettes for greatest success.